The Fran Lebowitz Reader brings together in one volume, with a new preface, two best sellers, Metropolitan Life and Social Studies, by an "important humorist in the classic tradition" (The New York Times Book Review) who is "the natural successor to Dorothy Parker" (British Vogue). In "elegant, finely honed prose" (The Washington Post Book World), Lebowitz limns the vicissitudes of contemporary urban life - its fads, trends, crazes, morals, and fashions. By turns ironic, facetious, deadpan, sarcastic, wry, wisecracking, and waggish, she is always wickedly entertaining. My daughter read this and gave up less that half way through. I think you have to hear her deliver her own prose. She is a master. I adore her. I get her humor even though I'm not a New Yorker but I am an ex smoker. She makes me laugh out loud. She writes very well-although I understand she had a long period of writer's block. Until I read this I thought she was famous just for being all over the social pages of Vanity Fair. I hope she writes and narrates more for 'our listening pleasure'. I've been a devoted fan and avid reader of Fran for years but honestly have no idea what this was supposed to be. 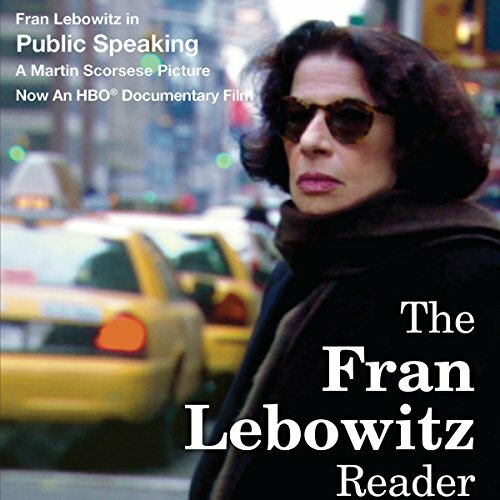 Would you consider the audio edition of The Fran Lebowitz Reader to be better than the print version? Laughed out loud several times. Anyone who follows writers must hear Fran Lebowitz read this. Lebowitz's dry wit coupled with her dry delivery create an unforgettable entertainment experience. She's a joy to read; she's a joy to hear. She alone can breath the necessary rhythm into her words. What was one of the most memorable moments of The Fran Lebowitz Reader? The entire listening experience is memorable. Which character – as performed by Fran Lebowitz – was your favorite? This is wonderful collection of what amount to short quips and observations written in a highly entertaining way. However, even with Ms Lebowitz's rich voice it remains a work far better read on the printed page. After about the 30th short piece that familiar pattern -- which is amusing in the printed work -- begins to become a little annoying. Still, these pieces are just so wonderful that they certainly surpass most offerings on Audible. In particular the piece on how to tell if your child is a writer is intensely funny. If you could sum up The Fran Lebowitz Reader in three words, what would they be? If you're not familiar with the brilliant and funny Fran Lebowitz, this book is a good introduction. In the preface Fran acknowledges that many of her stories are outdated, which they are. The book was written several decades ago. Some stories have remained relevant, others have not. But the chapters are short so less interesting ones pass quickly. I wouldn't recommend that you drop everything and get this book, but I also don't regret having purchased it nor having spent the time to listen. Someone that likes boring lists of unfunny things. Would you ever listen to anything by Fran Lebowitz again? Who would you have cast as narrator instead of Fran Lebowitz? What character would you cut from The Fran Lebowitz Reader? The only reason I gave this book one star was because I couldn't give it none.